It's a comprehensive "private school" for your puppy! Your pup will spend each day learning manners from a team of experienced dog trainers, playing with age-appropriate friends, and gaining valuable socialization in a city environment. Would you like the most complete training program for your puppy? 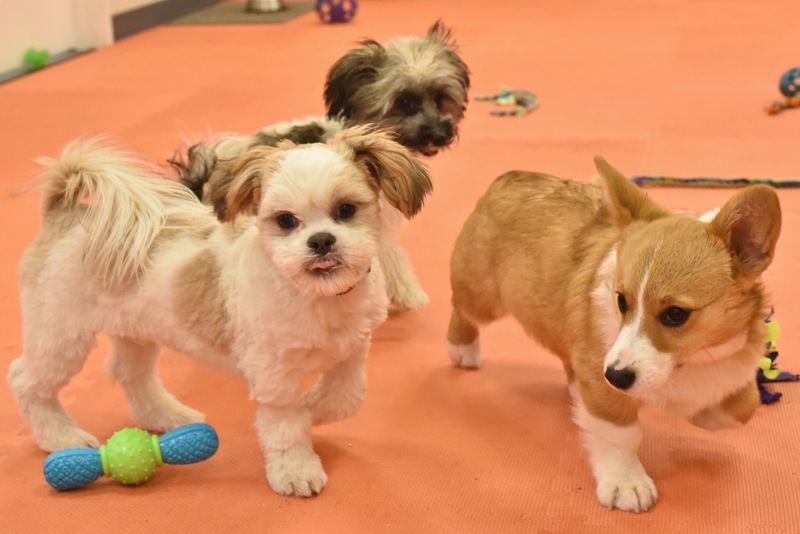 Our innovative Puppy Day School in Providence, RI combines the best of daycare and dog training to create a jumpstart program for puppies from eight weeks to six months of age. Puppy Day School teaches basic manners, boosts crate training and housebreaking, and provides crucial socialization with other dogs. Our program ensures your puppy will grow up to be the companion you've always wanted. 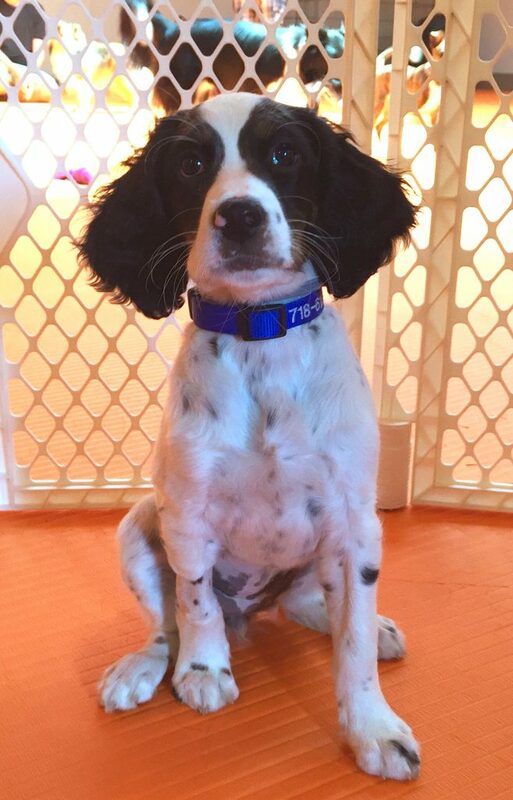 You'll have peace of mind knowing our experienced Academy staff is spending the day training your puppy, so you can work or run errands worry-free. Instead of coming home to chewed furniture or soiled carpets, you could enjoy each evening with a happy, well-behaved puppy who has less energy to devote to nipping, chewing, and other undesirable behavior. This is NOT doggy daycare. Adult dog daycares may be overwhelming to young puppies and can encourage undesirable habits, like pottying indoors, barking, and jumping up on people. At the Academy, we encourage calm, polite behaviors and prevent unwanted traits from developing. We also maintain a tighter puppy-to-staff ratio (5-to-1) and at least one professional dog trainer is on duty every day. Zipper has really changed and made progress – he’s much easier to be around, we are having more fun and less frustration as we learn the best ways to keep him busy, and we are finally enjoying our puppy! I know that he is enjoying class, he is excited to head out every morning!" --Megan L. & "Zipper"
These guys deliver! We brought our puppy, Rusty, to Puppy Day School and with love, patience and discipline they trained him and us! It gave Rusty a chance to socialize in a controlled environment. We get compliments on how well behaved Rusty is for such a young pup (not quite 10 months old) and are smart enough to give Spring Forth the credit. We can't thank them enough." --Tricia O. & "Rusty"
Our number one priority at the Academy is providing positive socialization experiences during your puppy's formative weeks. Puppies play with each other, carefully selected adult dog "teachers," and our Academy staff. All interactions are closely supervised, to ensure your puppy learns to greet others nicely. Overtired puppies are like overtired toddlers: cranky! We break up the school day with plenty of quiet time and naps so your puppy stays well-rested and pleasant to be around. Bring your pup's meal(s) from home and we'll deliver them in mentally stimulating food-dispensing toys or as part of training sessions. Our puppy training curriculum focuses on basic manners, such as sit, down, coming when called, loose leash walking, enjoying grooming and nail trims, self-control around food and toys, and politely greeting people. You'll have the most well-mannered puppy on the block! You'll be able to e-mail any dog-related questions to our training staff and get a fast, thorough response. Ask us about training, exercise, chews, leashes, events - anything! Space in our program is limited, and we frequently have a wait list. If possible, we recommend scheduling an evaluation before you bring your puppy home. If you already have your puppy, don't delay! We've created a Frequently Asked Questions list that should tell you all you need to know about Puppy Day School, and you can check out our Rates & Policies online. Still have questions? Contact us - we'd love to talk to you about your puppy! Contact Us About Your Puppy! "Puppy Day School meets all of the socialization and developmental needs of puppies; Katherine sees the evidence of this in the speed with which puppies’ behaviors improve. All sorts of puppies are benefiting from Katherine’s new approach to the early weeks and months of puppy training, socialization, and daytime care."